Latest Update On Mersal! Vijay's Movie Making Records In Screen Count! There are just 8 more days for Mersal to hit the screens, and the mania for Vijay's film has begun and is spreading throughout the state, country and worldwide like a wildfire. It was recently reported that Mersal will be the second Tamil film to be screened at the Le Grand Rex, France, which is the largest theater in Europe with more than 2000 seating capacity. Similarly, but in a much grander level Mersal will be the first Tamil film to be screened in Japan at four different locations; Tokya, Kanagawa, Osaka and Nagoya. And again this is will be the first film to get aFriday evening show in the country. Exciting as that information is for all the Thalapathy fans, back in town Mersal is facing a number of hurdles just before its release. Though it is still unsure whether the movie will hit the screens this Diwali due the ongoing entertainment tax issues which stopped all new releases in the state from Oct 6th. 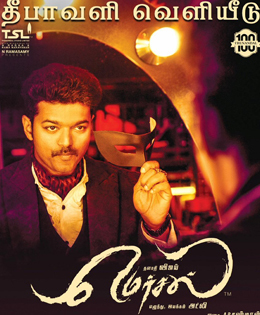 The makers of Mersal, has promised that the film will for sure have a worldwide release on the said date. Meanwhile, after Tamil Nadu, Vijay's films are celebrated in a grand manner in Kerala, and now according to reports across media, the members of Film Distributors Association of the state have voiced their concern against releasing the film in 250 plus screens, because they are worried that they might face a huge loss like they did with the hero's previous film Bhairavaa, which was a box office dud. The talks are on table with the Kerala distributors Global United Media to resolve the issue. Theatrical exhibitors around the world are pulling out the stops to see that Mersal hits it big, with a worldwide opening screen count of 3,300, the most ever for a Vijay film. In addition to the actor’s home state of Tamil Nadu, expect big rollouts also in the traditional Tamil movie strongholds of Andra Pradesh, Telugana, Karnataka and Kerala, and overseas in the US, UAE, Singapore, Malaysia and Sri Lanka.